Once a year industry professionals of the surf, skate and wake industries get together at the Orlando Convention Center to practice their skills of mixing business with semi-cold domestic beers. In order to impress their sponsors, young pro riders are usually the first to get intoxicated; while experienced industry execs that can afford to purchase cold, imported beer, choose to conceal it in a soda cup. 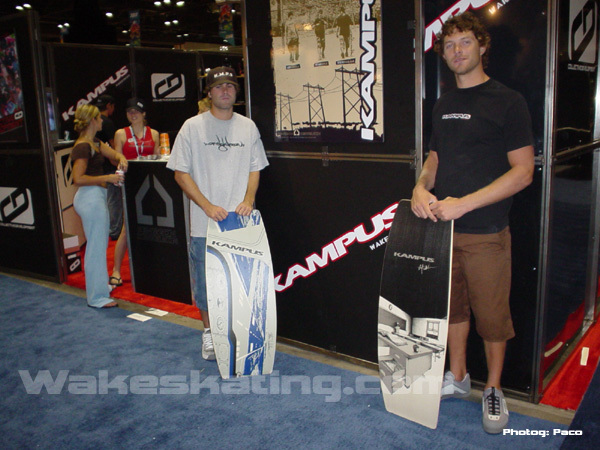 Nevertheless, things get done at Surf Expo; after all it is the most important trade show held on the East Coast. It is also like a State ofthe Union presidential speech, where the objective observer can make a good assessment of the industry, its players and snakes. And while the big wakeboarding companies and their booths that haven't changed in the last ten years remain boring, this reporter would rather focus on the new and exciting. It’s the young companies that keep me coming back to this annual gathering. 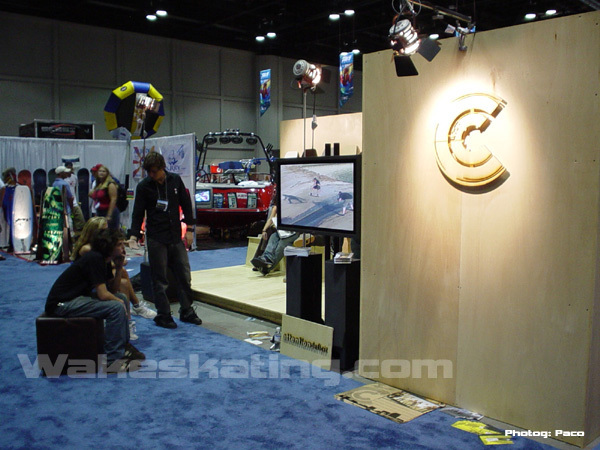 Securing excellent booth location and scoring high in the creativity department, the first compliment must go to Linear Distribution and Cassette Wakeskates. Not only did they build a beautiful booth on a start-up company budget; the new boards and accessories couldn't look better. Back it up with a flat screen showing Aaron Reed doing his thing in Sfumato, and you’ve got yourself a drooling crowd in front of the booth at all times. 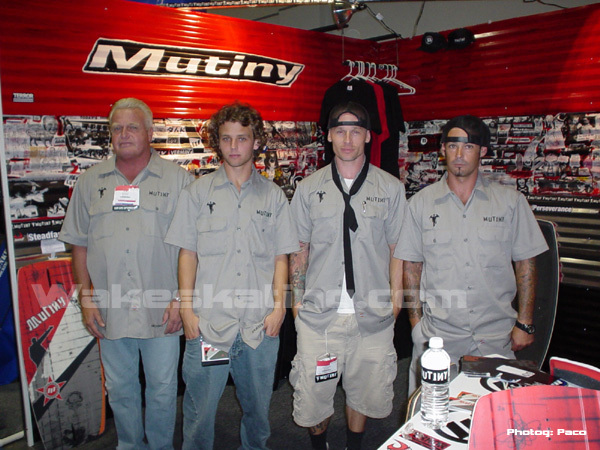 Never before has the skate and surf industries looked at wakeboarding in a respectable manner, but mention Cassette and their team of heart throbs and everyone agrees--these guys are hot. Hang out with them long enough and you will be good looking, too. You might not have as many fans as Danny Hampson but then again; some guys have all the luck. Crossing over from the west side under the leadership of dean Duane Pacha, Kampus Wakeskates showed up this year with a product line as solid as their new metal booth. The new boards and graphics were very impressive, as Kampus continues to innovate by mixing wood with thin inner layers of composite fibers and a few other secret recipes that I can't disclose without getting expelled from the institution. Pro riders Leif Erkila and Steve Wahlman were at the booth to show me their new pro models. Both pro models have features unique to their riding styles and have a special bottom composite coating to protect the board from slider damage. It was particularly exciting to see how well dedication and loyalty to Kampus has paid off for these two scholars. But then I had to push them away so I could get my hands on the new Kampus Wakeskate shoe. Resurrected by Erich Schmaltz and with the support of some good friends in high places, Mutiny and its uniformed soldiers looked ready for battle. The original concepts implemented in their new product line bring new ideas and a fresh approach to wakeskate design and manufacturing. Surprisingly wide and very tough, the new Mutiny wakeskates remain true to Erich's bold design ideas and manufacturing techniques that are so solid they’re almost exaggerated. 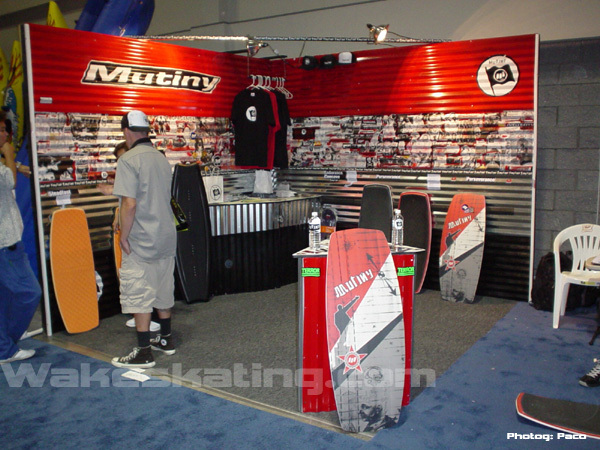 Also displayed at their booth was some Mutiny soft goods that looked just as tough as these west coast gangsters and their boards. Their booth might have been covered in camouflage, but it was very visible that Ronn Seidenglanz of Sidewayz is representing the wake video industry like a true player. Expanding on his talent as a filmmaker, Ronn and his outgoing team are also distributing titles produced by other quality filmmakers, publishers and photographers. At the show they also displayed their new line of Sidewayz soft goods and accessories as well as the new Butter tee designs. Their extensive knowledge of the video industry and efficient service make them a great source for original products to retailers and online consumers alike. but not from another galaxy--it’s Canadian built and with a factory installed Mercruiser engine the European look is closer to the border than you would think. The reps at Sfvara were very approachable and excited about their boat. Something its competitors should hope for... unless you want to buy a boat from a car salesman. 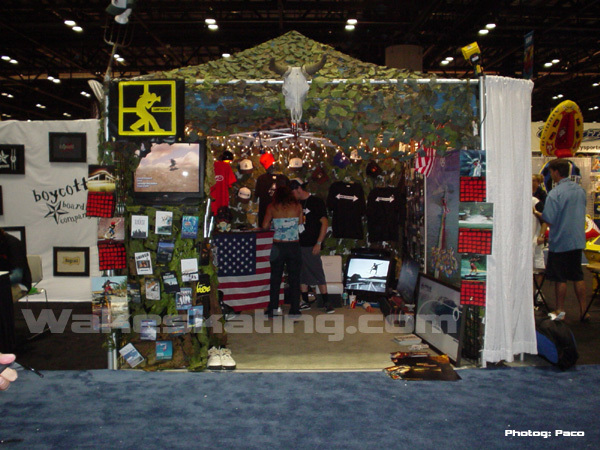 With a set up the size of a city block and walls that seemed to reach the sky, this booth was impressive and intriguing. And just like in Area 51, access to this booth apparently doesn't come easy. I figured that after many years of clubbing in a city known for its hard-to-access clubs I was going to talk my way in, but I was never able to get pass the velvet rope and the bouncer that guarded its oversize door access denied. This left me curious as to how many TVs, speakers and halogen lights a tower can hold. Stay tuned to Wakeskating.com for more articles from Buttermag.com and remember the importance of keeping it real.